The Monster Series will run from March 10-17 and includes 194 tournaments with buy-ins between $2.20 and $55. 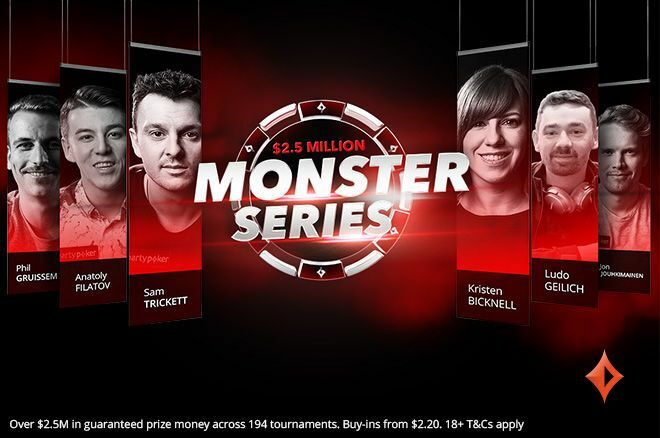 There is no rest for the folks over at partypoker who have announced the $2.5 million guaranteed Monster Series returns to the site on March 10 on the back of a successful KO Series. Monster Series is a low-to-mid stakes online poker tournament festival with buy-ins starting at $2.20 and increasing to $55. A total of 194 tournaments are scheduled to take place between March 10-17 that have combined guaranteed prize pools in excess of $2.5 million. partypoker players will be able to put their tournament skills to the test in a range of different formats, including freezeouts, re-entries, PKO, turbo, hyper-turbo and deepstacks events. These take place on six-max, eight-max and mix-max tables depending on which day of the week it is. Sundays boast of the biggest guaranteed prize pools, as you would expect, with the opening day seeing more than $500,000 guaranteed to be won. The first Monster Series events on Day 1 commence at 2:30 p.m. and cost $2.20, $5.50 and $22 to enter, but despite these being buy-ins that are at the more affordable end of the scale, the guaranteed prize pools for these tournaments weigh in at $10,000, $20,000 and $50,000 respectively. The biggest events on the opening day of Monster Series shuffle up and deal at 7:00 p.m. All four are PKO tournaments and include a $55 buy-in with a massive $150,000 guarantee. Other buy-ins of $22, $5.50 and $2.20 are also available at this time and each has a substantial guarantee attached to it. March 17 is the final day of Monster Series and players can get involved in seven Championship Events. The buy-ins range from $2.20 to $55 but the guaranteed prize pools are worth from $10,000 up to an impressive $200,000. Monster SPINS are now available in the lobby that award cash prizes and Monster Series tickets worth up to $55. SPINS are three-handed hyper-turbo sit & go tournaments where the prize pool is randomly selected before the first cards are dealt. All Monster SPINS are winner-takes-all, and here’s what you can win. If you fancy playing in the Monster Series, you’re going to need a partypoker account. Download partypoker via PokerNews, and deposit using the bonus code “PNCOM” for an exclusive first-deposit bonus.